We’ve believed that a diet extremely low in fat must be good for us – the lower the fat, the healthier the food and the lower in calories, so we’ll lose more weight, right? Well, yes, but there are others too! Poly – and mono-unsaturated fats are also good. These, along with omega-3 fatty acids can keep you feeling fuller longer, and can even make your metabolism work harder in order to break them down in your system. Some healthy fats have even been known to improve cognitive function, lessen belly fat and improve heart health. So, where can I find these? Egg yolks contain healthy fats as well as vitamin A, some B vitamins, choline, vitamin D and antioxidants. The picture above is one I took of my breakfast not long ago – a whole hard-boiled egg, wilted spinach and quinoa. Delicious and filling! Cocoa butter is sweet tasting, and is also high in antioxidants and omega-9 fatty acids. 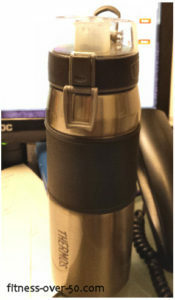 Added it coffee drinks (no more high-fat lattes! ), smoothies and even homemade fiber/power bars. Avocado is high in omega-9 fats as well as high in fiber. Avocado is great for healthy skin and digestion. Avocados can also be good for post-workout recovery, since they contain electrolytes. Dark chocolate is high in the same fats as cocoa butter, as long as the dark chocolate is all natural. Dark chocolate also contains antioxidants and is good for the heart. Yay! Flax and chia seeds contain omega-3 fatty acids. They are an easy additive to any smoothie or bowl of oatmeal. Eat more fat! Just make sure it’s the right kind of fat! Fitness and mindfulness go hand in hand. I saw so many examples the other day. I was at an agility trial where hundreds of people and their dogs compete. There’s a lot of down time at agility trials, so it’s a great opportunity to catch up with friends and people you see frequently at trials. It was before 8:00 in the morning and people were pouring coffee and grabbing pastries, cake, and cookies without thinking about what they were doing. Many had gotten up before 5, and already had breakfast. It was like they were on automatic pilot. When I talk to my agility friends I eat pastries. And that made me think about other friends. If snacks are out, they’ll eat them. Cookies, nuts, cheese. It doesn’t matter. If munchies are laid out, they go in the face. Now, don’t get me wrong – I love cake and nuts and cheese as much as the next person. But, do I really need it? It’s easy to get caught up in mindlessness. You see others engaging in mindless behavior – whether it’s eating junk food, staring at a screen or engaging in gossip. No, I do not need that piece of cake at 9:00 in the morning. I do not need to be scrolling my Facebook newsfeed for hours on end. I can do better. Now, that’s not to say that every second of every day must be productive. We all need down time. But pay attention to what you’re doing. Make a decision. It’s OK to say “For the next 15 minutes I’m going to play a stupid game,” as long as you’re aware of what you’re doing! I love quinoa. It’s nutty, it’s easy and it goes with practically everything. It picks up the flavor of whatever you’re mixing it with and doesn’t impose its own flavor. I recently made a batch and had it over several days for breakfast. You see a picture here, mixed with fresh spinach and a hard-boiled egg. Just a touch of seasoning and – delish! 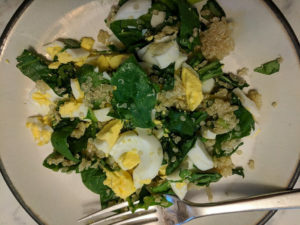 I mixed the spinach when the quinoa was still warm, so the greens wilted just a little. I made the quinoa according to package directions – 1 cup of quinoa to 2 cups of water, let it come to a boil and then simmer for about 18 minutes. Fluff with a fork, and it’s done. But if you use chicken, beef or vegetable stock instead of water, that adds its own flavor and is particularly yummy. If you use stock, lessen the amount of seasoning you add. Have quinoa for any meal! If we have any left over, sometimes I’ll bring it for lunch mixed with leftover chicken or turkey and lettuce or other greens. It has staying power and will keep me until dinner. You know I hate being hungry. (I’m not a nice person when I’m hungry.) But I also hate taking time to eat something in the middle of the afternoon when I’m busy doing other things. 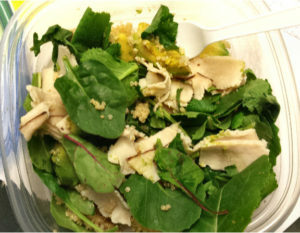 Aside from the flavor, why do I love quinoa so much? It’s gluten-free (not a big selling point for me, since I also love bread…), and it’s also high in protein. Quinoa also has about twice as much fiber as just about any other grain. It’s also high in Riboflavin (Vitamin B2) and manganese. It’s rich in magnesium and also contains lysine, iron, Vitamin E and all 9 essential amino acids! So quinoa is more than a fad. I think it’s here to stay! I know there will be a place for it in my pantry. Hydration – good for everything! Drink water! Lots of water. It’s too easy to put your head down and do what you need to do without coming up for air. But, we all need to drink water during the day. Not the 64 ounces that we were once told, but a substantial amount! It’s good for your skin, good for your digestion, good for your brain! When I don’t drink enough water during the day, I find that my thoughts become fuzzy. Sometimes I even become disoriented. (And that’s not an easy thing to do, since I’ve lived in the same house for lots and lots of years…) That’s a sure sign of dehydration. And it’s easy enough to fix, provided that you don’t let it go for too long. Just take a drink of water. And if I’m really into a project and know that I’ll be engrossed in it, I don’t hesitate to set a timer for 20 minutes so that I can get up, walk around and get a drink of water. And to brighten the taste, sometimes I’ll add a drop of lemon essential oil. It’s got that great fresh lemon taste without the acid of actual lemon juice! Exercising in an hour? Have a cup of coffee! It’s not just for breakfast any more! Coffee can improve your workout, researchers have shown. Researchers conducted a study in which a sample of inactive men were monitored biking with and without caffeine. While the men said they put forth the same amount of energy whether or not they had consumed caffeine, the results revealed faster cycling rates after caffeine consumption. Another set of researchers conducted a study and found participants who had caffeine before a workout had an easier time holding back cravings. In fact, those who had caffeine ate 72 calories less after the workout than those who hadn’t consumed the stimulant. Heidi Skolnik, a sports nutritionist, also says that coffee also increases the release of dopamine and other feel-good neurotransmitters. So you can work past what you might otherwise perceive as pain or weakness. The benefit of coffee to your workout starts about an hour after you drink it. Now, don’t go crazy! 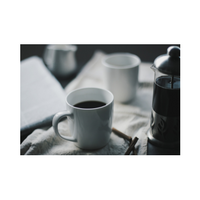 Putting in lots of cream and sugar or other calorie-laden additions might taste really good, but the extra calories will outweigh any benefits the caffeine will give you. A little milk is good though – the protein and carbohydrates it adds will help kick-start your brain! And remember to drink water while you’re exercising. It’s important to stay hydrated, and coffee alone won’t do that! Get a good night’s sleep, and drink plenty of water and you’ll get the most benefit from your workout. We’ve all been there. But the pizza looked so good! I couldn’t resist the Alfredo! Just one more piece of apple pie? Munchies during the game! Mindless munchies watching a movie. And now, even a day later, you still feel stuffed. Don’t beat yourself up about it now. What’s done is done. You can’t go back in time and not eat all that (no matter how much you might want to!). And you can’t starve yourself today! Your body still needs the fuel to carry on today! Do your regular workout, perhaps with a little more intensity. Walk a few more blocks. Drink a little more water. If you have watercress in your crisper, put some in your salad – it protects your cells against free radicals, and is a natural diuretic. Squeeze some lemon in your water – the Vitamin C helps detox your body and burn fat. Plus it helps with digestion and it’s delicious. Eat more dark leafy greens – in your salad, in your soup, or saute them with a little olive oil. Dark leafy greens boost chlorophyll levels in your digestive tract which helps to eliminate environmental toxins. 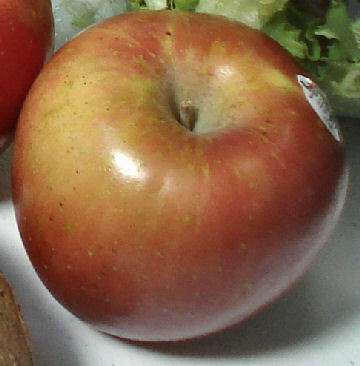 Have an apple (or another fruit) – fruit is full of vitamins, antioxidants and fiber. Eat some cabbage, artichokes or beets – they’re great for cleansing the liver. Ginger and garlic help eliminate free radicals. There you have it. Go eat some healthy stuff. But don’t overdo it! I’ve been re-introduced to the wonders of cauliflower! We’ve always just steamed the florets and added a pinch of salt and perhaps a bit of butter, but I learned that you can do so much more to it! Cauliflower contains Sulforaphane, which is a cancer-fighter, helps to reduce blood pressure and improves kidney function. It also contains Sulfur which is an anti-inflammatory and helps to remove toxic substances from the body. This versatile vegetable also contains multiple antioxidant phytonutrients. One serving of cauliflower contains almost a whole day’s recommendation of Vitamin C. It also contains Folate, Vitamin K, Fiber and Omega-3 fatty acids! Wow! I mentioned that a key property of cauliflower is fighting inflammation. Inflammation can contribute to many debilitating illnesses, including osteoarthritis, rheumatoid arthritis, heart disease, Alzheimer’s disease, Parkinson’s disease and even cancer. Reducing inflammation also stabilizes blood sugars, helping to manage and prevent diabetes. Studies have shown that cauliflower, when consumed once a week, helps fight colorectal cancer. And cauliflower doesn’t have to be cooked! It’s been shown that eaten raw, cauliflower binds with bile acid to help cholesterol levels. Steaming cauliflower and eating it just like that is still a great option. And steaming is much better than boiling cauliflower, according to the experts. When boiled, many of the phytonutrients are left in the water. 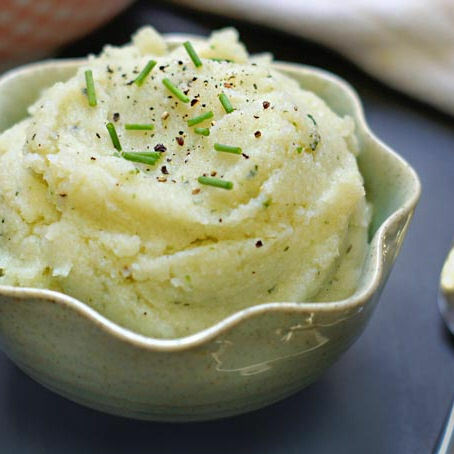 Besides mashing cauliflower and adding a bit of butter and a dash of salt as a healthier alternative to mashed potatoes, I’ve got to try ricing cauliflower! People swear by it! And using it as a pizza crust. A friend says you can actually pick up flattened riced and cooked cauliflower like bread! You try to eat healthy. You’ve even counted all the calories you consume in a day. You buy organic produce, eggs from cage-free chickens. You only eat beef from grass-fed cows. You’ve tried to cut out grains from your diet. And still the weight stays on. You try running more, different exercise programs, and nothing seems to be working. The solution may be a simple formula applied to your dinner plate. And it’s so simple you’ll think it can’t possibly work. But it does! A healthy plate is based on plants. One-half to 3/4 of your plate should be filled with plant-based foods. Plants provide fiber, vitamins and minerals for nourishment. And the plants can be fruits, vegetables, beans, legumes, seeds, nuts, and whole-grain foods. Plant-based eating is in line with guidelines set out by the USDA’s Dietary Guidelines for Americans. Look at my plate above. Most of the plate is broccolini and sweet potato. Not a lot is chicken – and that’s lean chicken, no skin! Healthy and tasty, to boot! Plus plants have fewer calories than meat protein and simple carbohydrates. Think of all the time you’ll save by not counting calories! Of course, like everything else in life, I believe in moderation. So my healthy plate works for me most of the time. I do indulge in pizza and chocolate cake. Just not all the time! Who thinks that healthy meals are boring? Not me! Nope – every meal can be tasty, filling and healthy. If you’re trying to lose weight, the worst words in any language are “I’m going on a diet!” Yes, “diet” is a 4-letter word, but it’s just a word. It’s not good, bad or indifferent. Your “diet” is just what you eat. Food is “fuel.” And that’s another 4-letter word. Food is what fuels your body. It’s imperative for everything! Every meal has to be filling, tasty and appetizing! It has to last for a few hours, until your next meal or a (planned) snack. Lean protein and complex carbohydrates help in filling you up. The chicken in this picture was grilled, with a rub of spices, which add no calories but tons of flavor. I sprayed the grill with a little oil so the chicken wouldn’t stick. 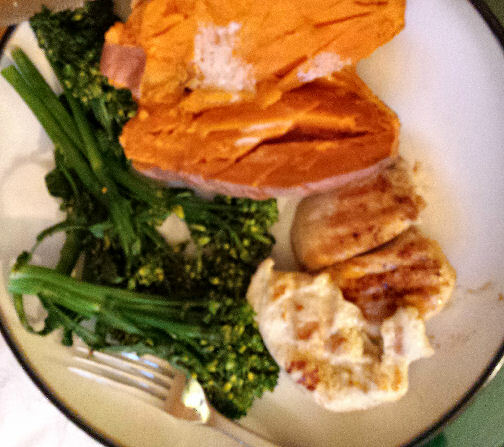 The broccolini was steamed and sprinkled with a little of the spice mixture, and the sweet potato was baked. I did add a tiny bit of butter to the potato. No artificial stuff – a tiny dab of butter for a bit of umami goodness. Yes, it adds a few calories but satisfies the craving for more. What makes this dish appetizing to me are all the different colors. Sometimes in the depth of winter we’ll make meals that are all one color, which are basically unappealing to the senses. So whenever possible, we try to include food of many different colors. They satisfy the palate, the stomach and the soul. It’s way too easy to zip in and out of a fast-food drive-thru on your way home from work. And that’s really dangerous. The portions are way too big. The food has too many calories, and it’s full of fat. It’s deep-fried. If you’re trying to watch your weight, and eat clean and healthy then drive-thrus are the most dangerous places on the planet! Yes, french fries are delicious. Nothing can beat a burger and fries. Unless it’s a burger and fries with a shake. But I always feel a little sick and bloated before bed when I indulge like that. And it’s just not worth it. What is worth it is taking a few minutes to plan ahead for a delicious, healthy meal. The first few times I planned meals for a week it was a real chore. Not fun at all. But then I wrote notes through the week about meal ideas and then I gathered those notes to plan the week’s menus and it was no big deal. The key to actually following through on the meal plan on busy week nights is to keep it simple. Like the grilled chicken, steamed broccolini and sweet potato pictured. I microwave the sweet potato, so it just takes a few minutes. It’s done when the chicken is. I also use the microwave to steam vegetables. I do the potato first and wrap it in foil to stay warm and finish cooking. Delicious, nutritious and easy!